We arrived at the hotel around half 6 and the girls all passed out in our day-use room, while I fought sleep with a book. Later that morning we met our new guide, Hent, who showed us around Islamic Cairo, Christian Coptic Cairo and the Khan al-Khalili Bazaar – the biggest bazaar in Egypt. Hent was awesome, like a small cheeky female version of Sam. 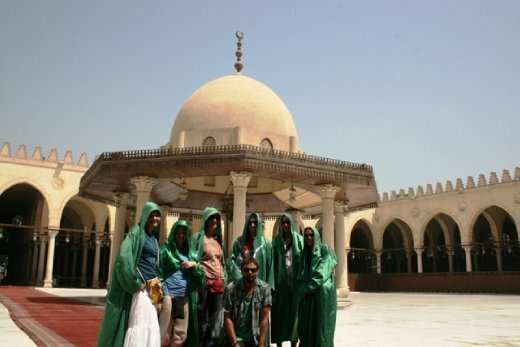 She took us to a Jewish synagogue, a Christian church, and the oldest Mosque in Egypt, where we had to dress up like elves in green robes to cover our hair. Bloody Sam told us not to bother wearing scarves as they would give us “nice robes” to wear – cheeky bugger! I think it would have been much more respectful to wear scarves as the robes looked ridiculous. Hent sat us down and told us about the Muslim faith as well as her take on life as a modern Muslim woman. She’s pretty progressive and said she wouldn’t accept a multiple marriage and would certainly continue to work as a married woman. Nice one! The girls immediately decided they needed to set Hent & Sam up together. We also got to see the “crypt” or underground room where it is thought that Jesus, Mary & Joseph stayed when visiting Egypt, over which the church has now been built. We stopped for lunch at a little upstairs restaurant overlooking the market, where we could eat our falafel wraps without being hassled by the salespeople. The market was quite an experience. I’m just glad I’d already had some exposure to the sales pressure and wasn’t interested in buying anything as it meant I was relatively unhassled. The best buy of the day went to Joe, who walked into a carpet shot and told the owner, “I’m fussy, but I know what I want and I’ll know when I see it.” After pulling out about half a dozen carpets he found one she liked, but would not accept the price she offered. After a bit of haggling during which neither party really budged, we left and got half way down the street before he ran up and offered a price very close to what she wanted. She was about to accept when the other girls (our seasoned travelers & bargainers) piped up that if he had chased us down the street then he wanted to sell it. So the argument raged until she finally added an extra 10EGP, at which he shook his head and walked away, before waving his hand for her to follow. You know the grumpier they are the closer you are to the actual price! The worse bargaining went to Jen & Carly, who kept insisting that they only wanted to pay 10EGP for a shirt, despite the fact that NONE of the multitude of shirt sellers would go below 20. Eventually we were surrounded by irate salesmen who wanted them to lead them to our imaginary salesman who was willing to sell a shirt for 10. We ended up leaving the bazaar in a hurry as the girls didn’t want a shirt enough to up their price. That evening the Americans went to pizza hut where they sweet-talked themselves into having dinner on the roof to watch the sunset over the pyramids, which was apparently quite romantic (pity their boyfriends weren’t there!) until random feral cats started appearing from all over the placed and having catfights in the corner and trying to climb on their laps. Ewww. The rest of us joined Sam at the bar where he was meeting friends to watch the Brazil vs Spain football match. It was pretty cool for him to invite us along on his night off, and the bar set-up was great – sections of couches around coffee tables each with their own flat-screen while the sound played through the main speakers. Much better than crowding under one wall-mounted TV in a pub. So we had smoothies while the Aussies ordered a sheesha, and this time we all managed to stay awake.